Featuring up to 31 minutes of flight time, up to 8km of 1080p video transmission, and Omnidirectional Obstacle Sensing*, the DJI Mavic 2 Zoom Drone is an ideal companion for snapping large, detailed shots or capturing breathtaking footage wherever you go. It also has support for Hyperlapse technology to let it quickly process multiple stable aerial shots and save them as JPEG/RAW photos on a microSD card (sold separately) and provide plenty of room for your own post-editing. Made with a powerful DIGIC 4+ image processor and CMOS image sensor, the Canon EOS 1500D DSLR Camera with 18-55mm Lens Kit is a suitable on-the-go option for budding photographers and professionals alike. Bringing a fun yet informative aspect to programming, the Sphero SPRK+ Edition Droid aims to spark children’s curiosity and unleash their creativity and inventiveness while making their own program or setting-up the robot’s interactions. Incorporating Bluetooth connectivity, this droid can be easily paired with your compatible mobile device wirelessly for easy reprogramming and control. Wearable tech with its own fitness program, turn fitness into a lifestyle with the Striiv Fusion 2. An activity tracker and smartwatch in one, Fusion 2 provides a comprehensive reading of your day-to-day activities while keeping you connected by sending alerts, meeting reminders, and app notifications on a built-in touchscreen. Stylish and innovative, the Samsung Gear Sport Fitness Tracker lets you monitor your daily activities while keeping you at the height of fashion. With a range of straps* and digital watch faces available, it can be customised to go with your look or the occasion. Compact and versatile, the Nonda ZUS Smart Car Charger lets you charge compatible devices, keep track of your car’s location, and more in a space-saving design. Adding vehicle intelligence through the free downloadable app*, the ZUS brings today’s technology to yesterday’s car. Lightning fast and power-packed for on-the-go productivity! Experience gaming like no other! Big Screens, Big Tech & Small Prices! with our range of Men's Shavers! Want personalised kids gifts with a special touch? Discover CustomiseMe by Harvey Norman! with our Science & Education range! No Interest. No Deposit. Monthly Payments. Reserve this product with Harvey Norman Online. Sleek and versatile, the Acer Spin 5 SP513-52N-58E1 13.3" 2-in-1 Laptop lets you handle productivity tasks or enjoy movies and music with ease, with compact, 2-in-1 letting you choose laptop or tablet mode to suit your needs. The Acer Spin 5 SP513-52N-58E1 13.3" 2-in-1 Laptop has an Intel Core i5 dual-core processor and 8GB RAM for seamless multi-tasking. Equipped with a 256GB SSD, the Spin 5 2-in-1 laptop has ample space to store important files and boots up quickly to minimise wait times. For more storage space, use the built-in microSD card reader. The Acer Spin 5 laptop has a 13.3" Full HD (1920 x 1080) touchscreen to deliver vibrant visuals and serve as an intuitive touch-based interface. For added convenience, it also has an Active Pen stylus for touch-based writing and control. To accommodate multiple devices easily, this laptop comes with one USB 3.1 Gen 1 port, one USB 2.0 port, two USB 3.0 port, and one HDMI port. 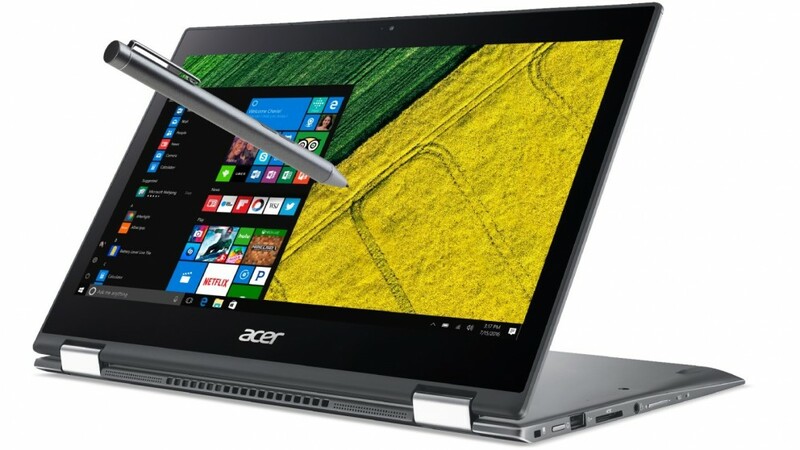 The Acer Spin 5 SP513-52N-58E1 convertible laptop has Windows 10 pre-loaded, providing convenient access to Cortana, your own digital assistant, as well as the Microsoft Edge web browser. Computers, laptops, and tablets help us work, play, and connect with the world. This guide explains the basics so you can begin to understand your computer’s potential and how it works. The right processor will give your laptop a pleasantly surprising boost, whether it’s offering lightning-speed performance or eliminating the need for an external graphics card. While it may seem confusing to worry about your computer’s processor, we’ll guide you through Intel’s CPU range and highlight the features and advantages of each model so you can shop with confidence. The Internet puts an unlimited source of information and entertainment at your fingertips. However, it can be hard to know where to start. This guide explains what you need — and what you need to know — to get online. Not all laptops are created equal — business laptops frequently feature conservative styling and long warranties, while consumer laptops can be personalised and accessorised to your heart’s desire. So, which laptop is best suited to your needs? Just follow our buying guide on notebook computers. Connecting your laptop to an LCD monitor that boasts outstanding picture quality and high levels of connectivity can drastically elevate your online experience. Our guide will help you discover which monitor will take your computer set up to the next level. Protect your purchase with Product Care®. Get a brand new replacement if your product suffers an eligible fault through our hassle free support process, plus enjoy a range of exclusive benefits like a product health check and free prints each year so you experience your new product even more. 6 Months Interest Free - No Deposit, No Interest, with Monthly Payments . © 2019 Harvey Norman Online | Harvey Norman Online is operated by the eComm Store Pty Ltd, an independent franchisee. Harvey Norman Stores are operated by independent franchisees.